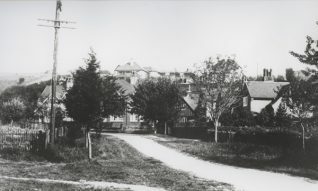 Reynolds Avenue, Withdean, c1930. This section of unmade road on the edge of Brighton became the bottom of Valley Drive. The empty downs leading to the Patcham windmill can just be seen at the top left. This house was built in North Street at the corner of Princes Place to promote the new estate at Withdean. The Valley Drive estate, built around 1932-34 to extend the former Reynolds Avenue, adopted the ‘Tudorbethan’ style of architecture that is perhaps best known these days from Sir John Betjeman’s BBC documentary Metro-Land (1973). Also known as ‘stockbroker Tudor’ after the aspiring middle-class market to which it was intended to appeal, the style featured decorative (ie, non-structural) black-and-white half-timbering on the upper floor, with an overhang above the red-brick ground floor. The houses were among the first to be provided with a matching garage in which to keep the Austin 7 in which the man of the house would drive to work from his home on the outer edge of Brighton suburbia. The Valley Drive estate comprises around three dozen homes, about a quarter of which are detached. In fact, they were not as grand as they may have appeared. 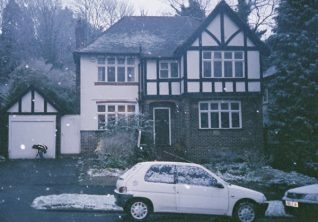 The house seen through the first flakes of snow falling in late 2004 (which was my home for over eight years) originally comprised a living room and dining room on either side of an oak-panelled and parquet-floored entrance hall, with a small, even pokey kitchen behind the dining room. Upstairs were three bedrooms and a bathroom. Round windows and the use of stained glass were also featured. All the houses have been subsequently extended to provide adequate family accommodation. 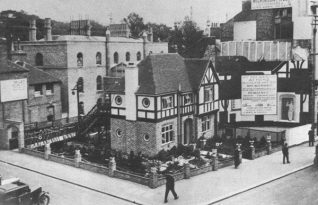 To promote the estate, the developers, Braybons, built a typical detached house in North Street, at the corner of Princes Place. 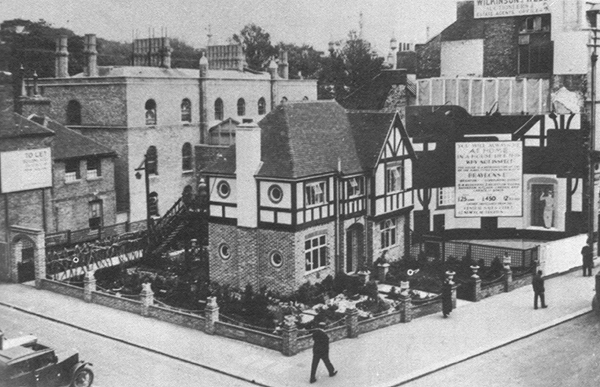 It was estimated that around 250,000 people visited the show house between November 1932 and July 1934. After the town-centre display closed that particular house was moved to Hillbrow Road, where it served as a show house and estate office. Braybon’s advertising used the same pitch as Metro-Land: ‘ a country estate in Brighton’. The semi-detached houses cost £895 freehold. Many years ago I bought I copy of The Growth of Brighton and Hove 1840-1939 by Sue Farrant, Kevin Fossey and Adrian Peasgood (University of Sussex CCE, 1981). Some time after moving into the house shown here I picked up the book and was surprised to find that the illustration of ‘1930s Tudorbethan’ was of my house. Unfortunately this did not add to the value of the property when I came to sell! We bought this house in Valley Drive in March 2005. We have done some develpoment to the property and have kept the style of the Tudorbethan. We are very happy to know that our house has been a big factor in Brighton and Hove history.